Strategic and technical advisory group for neglected tropical diseases subgroup on disease-specific indicators. World Health Organization, Geneva, February 7–8, 2015. The Mectizan Donation Program is co-sponsoring an exhibit in partnership with The Carter Center and the American Museum of Natural History titled “Countdown to Zero: Defeating Disease.” The exhibit uses photography, videography, and artifacts to highlight several global efforts to fight infections. An article explaining the critical differences in controlling, eliminating, or eradicating a disease. NPR, January 14, 2015. The Merck Mectizan Award is given to individuals who have demonstrated an extraordinary level of commitment to fighting river blindness and/or lymphatic filariasis. DECATUR, GA USA — 30 September 2014 – The Mectizan Donation Program congratulates President Rafael Correa, the Ecuadorian Ministry of Health, The Carter Center and its Onchocerciasis Elimination Program for the Americas, and the Pan American Health Organization on the announcement that Ecuador has been verified by the World Health Organization as the second country to eliminate river blindness, one of the leading causes of preventable blindness worldwide. 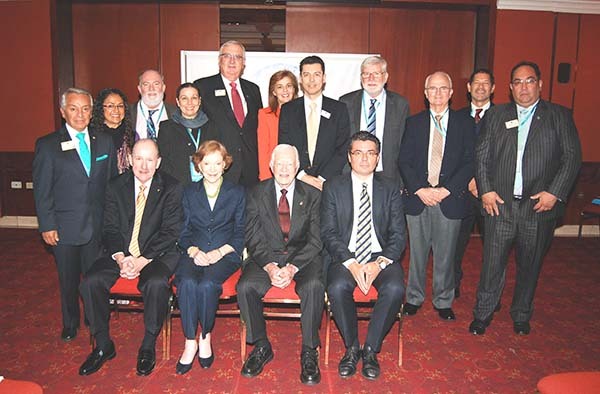 Please enjoy this story of the formation of a coalition to fight onchocerciasis, as told by Dr. William Foege, founder of The Task Force for Global Health, to Bill Gates. On April 2, the United to Combat Neglected Tropical Diseases: A Conversation on Progress webcast and live Q&A will be broadcast live from Institut Pasteur in Paris from 18:00 – 19:30 Central European Time/12:00 – 13:30 Eastern Standard Time. We’re pleased to share with you an opinion piece from the New York Times“Treating the Village to Cure the Disease” by Jason Silverstein on lymphatic filariasis (LF) elimination in Africa featuring quotes from MDP’s Dr.
Colombia recently eliminated this neglected disease through health education and drugs. The Mectizan Donation Program congratulates Colombia on its achievement as the first country to receive verification of elimination of river blindness from WHO. On Monday 8 July, in Cameroon, Sightsavers made a major step towards our goal of eliminating river blindness by 2020 with the distribution of our 250 millionth Mectizan® treatment.